Ernie Isley at Hendrix in Harlem, New York, New York, 11/26/2016. Brandon "Taz" Niederauer at Hendrix in Harlem, New York, New York, 11/26/2016. Liv Warfield at Hendrix in Harlem, New York, New York, 11/26/2016. Nona Hendryx and Fishbone at Hendrix in Harlem, New York, New York, 11/26/2016. Hendrix in Harlem, New York, New York, 11/26/2016. Fishbone at Hendrix in Harlem, New York, New York, 11/26/2016. Angelo Moore at Hendrix in Harlem, New York, New York, 11/26/2016. Alice Smith at Hendrix in Harlem, New York, New York, 11/26/2016. Liv Warfield and Brandon "Taz" Niederauer at Hendrix in Harlem, New York, New York, 11/26/2016. Saul Williams at Hendrix in Harlem, New York, New York, 11/26/2016. Nona Hendryx at Hendrix in Harlem, New York, New York, 11/26/2016. Ernie Isley and Nona Hendryx at Hendrix in Harlem, New York, New York, 11/26/2016. Rocky George and Paul Hampton BG at Hendrix in Harlem, New York, New York, 11/26/2016. Ernie Isley and Angelo Moore at Hendrix in Harlem, New York, New York, 11/26/2016. Ernie Isley and Saul Williams at Hendrix in Harlem, New York, New York, 11/26/2016. To celebrate what would’ve been Jimi Hendrix’s 74th birthday, a diverse group of musicians gathered to interpret his catalog at The Apollo Theater on November 26. 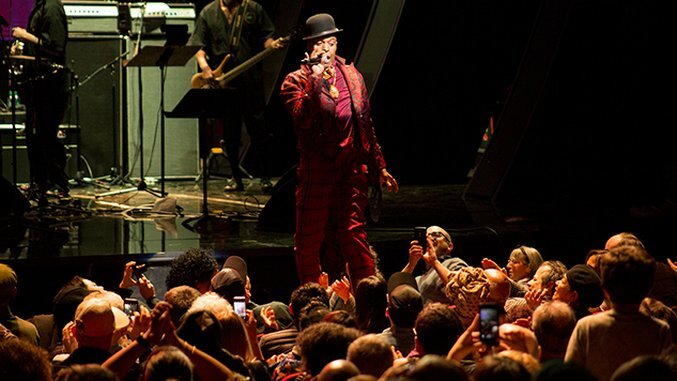 Fishbone led the way and acted as house band, while frontman Angelo Moore hosted the evening. A non-stop parade of talent paid tribute, including original flower-child Ernie Isley, poet and alternative hip-hop artist Saul Williams and powerhouse vocalists Nona Hendryx and Liv Warfield. But all in attendance would agree that the show-stopper here was 12-year-old Brandon “Taz” Niederauer. This little dude melted faces all night with outrageous chops and a fully-developed monster stage-presence. We can’t wait to see what’s in store for Taz.